Tensions within the India-China-Russia triangle complicate the BRICS grouping. The BRICS jamboree comes to Goa this week, with India hosting the 8th summit of a grouping which has grown into geopolitical engagement of limited significance. Jim O’Neill, an investment analyst at Goldman Sachs, came up with the term ‘BRICs’ fifteen years ago and soon thereafter the term became more than just an economic construct as emerging powers in the form of Brazil, Russia, India, and China started negotiating the terms of the post-American world order. The first summit was held in 2009 and South Africa was invited to join the grouping a year later, making it officially the BRICS. The last summit India had hosted was in 2012 in New Delhi. The economic rationale for the grouping today is rather tentative. The economies of Russia, Brazil, and South Africa are no longer what they were a decade back. India remains the only bright spot, being the world’s fastest-growing major economy in an otherwise gloomy global economic environment and China can regain its past growth trajectory if it succeeds in tackling its debt problem. Importantly, there are indeed some convergences in the worldviews of the BRICS member states and they continue to have a vital role to play in tackling the most pressing international challenges. They have also successfully underscored the point that the global financial and governance architecture needs a thorough overhaul in light of a transformative shift in the global balance of economic power. They have established the New Development Bank, with an initial authorized capital of $100 billion, half of which will be initially underwritten by the BRICS member states with each putting forward equal contributions of $10 billion. But what has been interesting to observe over the last several years of the BRICS’ existence is how little the grouping has been able to move on substantive geopolitical issues despite the lofty rhetoric of their annual summit declarations. Bilateral tensions have precluded that possibility and it is unlikely that this year’s summit will produce anything concrete on that score. This year’s summit comes at a time when India’s ties with China, in particular, are at their lowest ebb. Ahead of Chinese President Xi Jinping’s visit to India for the BRICS summit, Beijing has adopted a conciliatory tone by suggesting that “sound and stable” development of ties in recent years has proved that the “dragon” and the “elephant” can join hands and peacefully co-exist. But this comes against the backdrop of China supporting Pakistan on issues of core importance for India. At a time when India is seeking to isolate Pakistan on the global stage for its use of terrorism as an instrument of state policy, Beijing has repeatedly refused to back India’s move for a UN ban on Pakistan-based terrorist Masood Azhar. Furthermore, India’s decision to completely seal its 3,323-km-long border with Pakistan has also come under criticism from China. China has also blocked a tributary of the Brahmaputra river in Tibet as part of the construction of its “most expensive” hydro-power project, causing concern in India as it may impact water flows into the lower riparian countries. Finally, China’s move to scuttle India’s bid for Nuclear Supplier’s Group membership has also vitiated the atmosphere in New Delhi in support of stronger ties with China. India’s ties with Russia have also seen turbulence in recent weeks with Moscow deciding to conduct military exercises with Pakistan at a time when India was targeting Pakistan for its terror strike in Kashmir. Despite India’s opposition to Russia conducting its first ever bilateral exercise with Pakistan, especially at a time when Indian troops were also participating in bilateral military exercises in Russia, has raised concerns in New Delhi about the future trajectory of Russian foreign policy. During the BRICS summit, India will be seeking to re-engage Russia more substantively. Russia and India will sign a multi-billion dollar deal for S-400 ‘Triumf’ long-range air defense missile systems, an agreement on building Project 11356 frigates for the Indian Navy, and setting up a Russian-Indian joint venture to produce Kamov Ka-226T helicopters. The Russian and Indian leaders will also take part in the ceremony of laying the foundation for the third and fourth power units of India’s Kudankulam nuclear power plant. Though the theme of the Goa summit under India’s chairmanship is building responsive, inclusive, and collective solutions, the focus will largely be on bilateral relationships. In particular, India’s engagements with China and Russia will be keenly watched. India is likely to use the BRICS forum to garner more support to India’s stand against Pakistan after the Uri attack in September. And this is where the challenge lies for the BRICS grouping. If even on terrorism, a menace all BRICS member states face, there continue to be divergences, then it is highly unlikely that BRICS will be able to play a constructive global role in managing global security challenges. The future of BRICS acutely hinges on what signals come out of the Goa summit. On many fronts, India has grown more distant from the other members of BRICS. 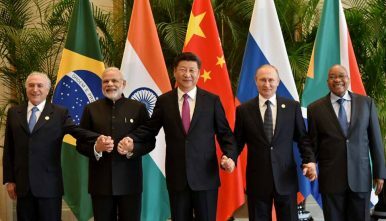 Keep BRICS and IBSA Separate Asia's New Democracies and the Liberal World OrderIs It Time to Put Away the BRICS?What to Expect as Leaders of BRICS, SCO and EEU Gather in RussiaIs BRICS a Real Bloc?